I thought I'd date my elder daughter that day after I went out for dinner with hubby the previous night. We didn't go very far but to this newly-opened doughnut shop called Scarsdale Artisanal Delights. Aside from doughnuts, Scarsdale also sells croughnuts, gourmet Sandwiches, coffees, cocktails, and a lot more. 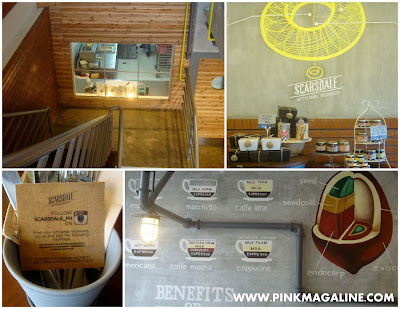 It is located within the S & R compound along Shaw Blvd, facing Project Pie and Starbucks Shaw. I've heard that their chocolate doughnut which name is 'the best chocolate doughnut in town' is a winner so off we went and check if the claim is true. This is the view of the counter at the first floor of Scarsdale. What we bought were salted caramel croughnut (P100), Scarsdale classic (P40) and the best chocolate doughnut in town (P55). Some random photos taken at the store..
My daughter and I in our afternoon snack/date..
We love our first visit at Scarsdale. 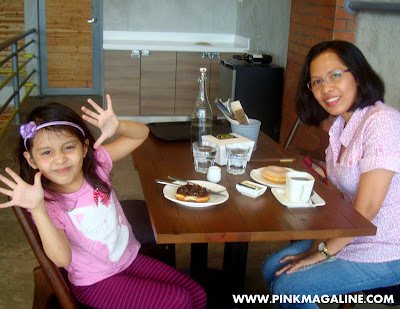 The place has a bright ambiance, neat because it's new and their doughnuts taste very good. The claim about having the best chocolate doughnut is indeed true. Though a bit pricey than other doughnut stores I know, I will still definitely go back to Scarsdale and try their sandwiches. Oh, they gave me a free doughnut and coffee after showing them my S & R membership card. Sheesh, I forgot to tell them not need to serve me coffee anymore 'cause I am not a coffee-drinker. The last time I drank coffee was in Istanbul, served by my mother-in-law's neighbor. I remember finishing a cup of sweet coffee with fresh milk. The taste of it lingered in my mouth for, let say 5 minutes, however the acidity it gave me lasted the whole day. Never again. Do you love coffee? Have you been to Scarsdale? 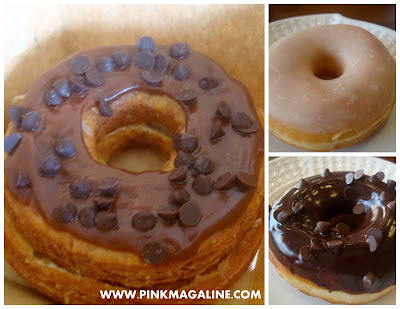 What's your favorite doughnut or croughnut? I really hope to visit that place someday :) I will try that best chocolate donut.